rich girls. : Make A Wish. It's been a not-so-fun day today, so I decided to treat myself with a little treat from Sass & Bide. 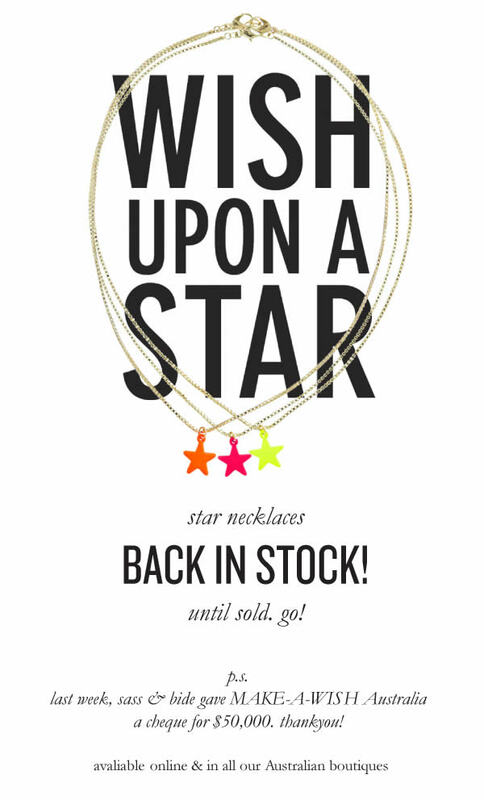 I ended up making the painfully hard choice and picked the yellow star necklace as the new addition to my jewellery box. Can't wait to brighten up my crisp white tee and faded denim. Sunniva, get on it! I need my fashion twin! love them! I want to get one! I love these i really want all three but i dont think i can get them in the UK can i??? I am working at my-wardrobe.com at the moment and it is really great, everyone here is lovely and i am learning lots-not to mention the beautiful clothes that i am surrounded by everyday!!!!! it would also be amazing if you could post me the necklace. I could send you money via Paypal if you have a paypal account? think i might have to get one of these too! so cute! E L L E R Y | The Silent Years.